Property series. Sonali Shah is in Cheshire with an expat couple who want their £450,000 budget to transport them back from Germany to the British countryside. Browse content similar to Cheshire. Check below for episodes and series from the same categories and more! but, in fact, its history doesn't go quite that far back. Find out where I am in just a moment. and it looks like the welcome home party could soon be in full swing. We can have a dance in there. And another rustic British feature really gets them fired up. I absolutely adore stable doors. Today, I'm in Cheshire and this is Peckforton Castle. this beautiful county has to offer. and covers an area of some 900 square miles. the average price of a detached home here is around £260,000. That's about £20,000 below the national figure. towards the Welsh border, than in the east, nearer Manchester. and your money will go that little bit further. So what's luring today's buyers to this lovely county? Let's meet them and find out. but they're now temporarily back in the UK to begin their house-hunt. they didn't exactly hit it off. and he was her least favourite frequent flyer. For five years, we constantly went out of each other's way. One day, I went to book a ticket to go to Scotland. And then I said the immortal words, "I'm just a pussycat." And she said, "You're not a pussycat." and, a year to that day, we got married in Mauritius. but, having both recently retired, they now want to return to UK soil. to say life in Germany is horrible. It isn't. There are some very good things about Germany. But it really is a mentality thing. and that's what we really miss. to Reynaldo's recent spell of ill health. 2013, I had a big operation for cancer. and I don't think I'd have got through it without her. And that's what Trish means to me. as it's where Trish spent a happy childhood. for a picnic in the Cheshire countryside. I'm quite happy to come to Cheshire. more time to indulge in their hobbies. We want to go and play golf. I already play. I've played all around the world. But, you know, I have bought Trish's golf clubs. and, when we get back, we intend to play golf together in the UK. in what would be their first shared property purchase. with meeting friends, going for a Sunday lunch. We want to buy this house together. for our life back home. as well as major transport connections to the rest of the UK. to finalise the specifics of their homecoming. Lovely to meet you, Trish and Reynaldo. -Lovely to meet you too. Now, what brings you to this part of Great Britain? so I have really, really fond memories of this particular area. because Reynaldo has relatives in Scotland. so it's a nice halfway house, really. And what are you both looking for in a property here in Cheshire? Well, what we want is something with kerb appeal. because that's what we prefer. Just a nice-looking property with minimum three bedrooms. I'm not averse to large rooms. I just think it's more space to breathe. Trish, has Reynaldo left anything out? Well, I'd like a manageable garden. -So you're being the sensible one? That's probably how it's going to be the whole way with us. Reynaldo is very much the heart and I'm the head. Good to note. Good to know early on. -We have actually missed out something. where we can go and have Sunday lunch. Now, you talked about a modern interior. What about the exterior of the property? What kind of style are you looking for? whether it's Victorian or whatever. Remind me of your budget. How much have we got to spend? Well, our budget is £450,000. OK. And how soon can you move? -We're ready to move straight away. We were ready three years ago. Let's not waste any time then. -We've got three properties lined up for you. Let's go. and an easy to maintain garden. they're particularly keen to be walking distance from a local pub. until we've had a good look around each first. that's full of Cheshire promise but which may well divide the camp. So, how is this property hunt going to work? We really, really do think the same way. to find someone that actually thinks the same way as I do myself. in the small village of Great Budworth. lined with a range of architectural styles. almost certainly the smallest library in the county. and less than a ten-minute drive from the nearest golf course. This is house number one. It's a very good-looking house. It was actually built in the 1950s, so not an old house at all. it kind of reminded me of a Georgian house. -Am I stretching it too far? No, it's definitely got the appearance of a Georgian house. It's definitely got kerb appeal and that's what I do like. Yes, it's very nice and the garden looks absolutely fabulous. -Very manageable for my wife. The family have done a really good job with the inside. -Let's go and have a look. around nine years ago, doubling its size. will also match up to their exacting vision. -This is quite nice and light, isn't it? I think it's a really nice entertaining space. With the French doors straight out onto your garden. Could you imagine yourselves in this kitchen? -Oh, this is a good size. Yeah, first impressions are a little bit on the dark side. They've actually done it up very nice. Well, this is an extension added nine years ago. -You really wouldn't know that, would you? No. The house actually finished there, so this is the extension. It's been well done, yes. I could imagine it could be quite cosy. Yes, we could definitely live with this. completes the ground floor tour. one more than our couple asked for. and a single room overlooking the front of the house. which just leaves the largest one for our buyers. This property comes with a master suite. Does that mean it has a dressing room as well? Dressing area and an en-suite. Now, who wants it the most? -I want it the most, but Reynaldo needs it the most. I've got the most clothes. And dual-aspect windows in the bedroom. but, because it has the dressing area, it could work. Well, you've seen most of the house. -Let's see if the garden is to your liking. -Then we can talk about the price. although I'm sensing Reynaldo is after a bit more space. in a large timber-framed garage. offering a high level of privacy. Well, is it worth considering? How much is it on the market for? Who'd like to guess first? I was thinking about 410-415. Well, I think it's probably going to be a little bit more than that. I would go about 435. It's actually on the market for £375,000. -That really is a surprise. And it makes you look at the house with different eyes. -and I'll meet you out the front in a bit? our first house is an extended 1950s cottage-style family home. a spacious kitchen-diner and four bedrooms. from a popular English village with that all-important pub. Well, I thought it was a good start. and, size-wise, I think it's more than enough for us. doing housework and doing the garden. The property is very pretty. It's certainly got kerb appeal. I think Trish likes it better than I do. That's not to say I dislike the property. but it's certainly a nice, little cottage. and to the village of Shocklach. a traditional country pub and a grocers and convenience store. it should appeal to our returning expats. and just a 15-minute drive from the nearest golf course. as it's only eight years old. -I think that's your taste, isn't it? -It's very pleasing on the eye. -Well, you like modern, don't you? -Yeah, I like modern. Yes, I do. -Does it do it for you, Trish? -Yes, I like it very much indeed. It is a modern house, but it's done in the traditional style, so yes. Shall we see if the inside suits you now? Oh, yeah. Looking forward to it. seems to have caught our couple's imagination. with oak flooring and character features. I thought I'd take you into the lounge, the drawing room, first. You could have a dance in there. -although the house is quite modern. It's not too large but it's cosy. again with solid wood floors and a nice aspect to the front. to check out the kitchen-breakfast room. but I think it's really tasteful. We can paint this white. Whether Trish wants to not! but white would actually go very, very nice with that. But, size-wise, is this big enough for you, Trish, when you're cooking? It's big enough for me, thank you. should they agree on the colour. all arranged off a central landing. and a smaller one which is currently being used as a study. That leaves the room we've earmarked for Trish and Reynaldo. This house has four bedrooms. This is the largest, the master. and, yeah, I think it could work. but you can appreciate it more, I think, from the garden. to a property they could move into straightaway. This would be your garden, Trish. This is beautiful and very manageable. And what I do like is the open view over the open fields. That's really lovely, isn't it? Up to now, the house is perfect. How much is it going to cost you, though? Right, well, I don't mind going first in this again. -Of course he doesn't mind! We are closer to Wales. I would actually go 415. Well, Trish is closer this time. leaving you £15,000 from your budget. -Is it something you'd be prepared to pay? It's something we'd be prepared to consider paying. -So who knows? Watch this space. The house is actually perfect. -Go and have another look around. Make yourselves at home. -And I'll meet you out front. and, upstairs, there are four decent-sized bedrooms. and the property is situated a short distance from a vibrant village. Ah, now. This is your room, Reynaldo. This is what you've always wanted, isn't it? -This is really, really nice. You can have some music, I'll serenade you. It's really nice, although it's not originally what I wanted. but I'm very, very impressed with it. It's my type of house. I quite like the new type build. But it's actually been built very, very nicely. but that's not a deal-breaker. Reynaldo doesn't play his cards to his chest. and this is the one he'll be pushing tonight. I feel this could really be the one. Could it? and I could see us living here. We could definitely live here. -we do have the Mystery House tomorrow. But, for now, let's go and get a drink to celebrate. and is set within the rural village of Cuddington. Cuddington may be rural but villages are well served by local amenities. and lies right next door to our mystery property. -What a pretty little cottage. And the location is so pretty. Well, this was built around the 1830s. but there are lots of quirks. that's used every Sunday for services. -Oh, won't have far to go, then, will we? because it was actually two cottages put together. -Yes. This is, from the outside, perfect. although Reynaldo is holding back a bit for the time being. handy for storing all his golfing gear. overlooking neighbouring fields and woodland. may have to use a little imagination. whichever way you'd like to interpret it. A log fire that serves both the dining room and the sitting room. -I love that feature. That's very nice. I'm not very tall but it does feel a little bit claustrophobic. but let's go round the house and we'll see if that feeling continues. -And the conservatory's a real sun trap, isn't it? You can really see the benefits of it. I mean, it would almost get too hot at some times of the year. -Never get too hot for me. -Shall I show you the kitchen? -on this part of the house, but the kitchen definitely doesn't. This is nice. Now, this is your taste, isn't it? It's very pretty and very nice. Erm... A little bit small. Do you know what I've spied? I think it's got a stable door. -It's got a stable door that leads out into an allotment. But it is a bit small. -How do you feel in here? It's smaller than we would have liked but it's an older property. Got to bear in mind, it's the first time you're walking in here. You get used to things, don't you? First time you met him, you didn't like him, did you? -There's a reason for that! But, yeah, the granite worktops are very, very nice. You could move in, five years later, you'll love this place, Reynaldo. Let's go onwards and upwards. and a neutral, family bathroom serves three of them. features a huge picture window. That just leaves the final room, which has its own en suite. This would be your master bedroom. That's fine. And an en-suite. -That's something I didn't expect in a cottage. The ceilings actually are quite nice. Quite high. -You haven't spotted the walk-in wardrobe. Well, there you go, that's my clothes. I'll be all right. -I have so many clothes. -He's moved in already. That's a good sign. You've persuaded him on the walk up the stairs. -That wasn't too difficult, was it? -It's quite... I like the high ceilings. -I like the shape of the ceilings. But the outside space is what you both love the most. Let's go and have another look at it. to see the potential here. where we can once again take in those beautiful country views. All of this could be yours. Not quite perfect, but almost perfect house. Really is. So, how much would Trish's almost perfect home cost? I'm going to let you go first since you love it so much. OK. I think this is about 460. I mean, let's say 400,000. It's on the market for £390,000. ..but, in that six weeks, it's been reduced by 30,000. The family have already found another house and they want to move. if, of course, Reynaldo would be happy here. -But that's something for you two to work out. and let's not forget its close proximity to a golf course. Oh, I love this house. This house is almost perfect. I could see us coming in here, putting her own touches on things. I think it's a really cosy house. Oh, this is lovely, isn't it? -..full advantage of the views. Oh, absolutely gorgeous, these views. This is my favourite room. Yeah, I don't mind you having this room, Reynaldo. Trish, I know, absolutely loves this house. I can just see it in her face. I wish the price had been as my wife had guessed. I think I'd have been... Had an out there. because this is actually a very good property in a very nice area. I have given you both a real dilemma, haven't I? -I don't know how we're going to solve this. Trish and Reynaldo have to find a compromise. Time to find out if they've made any progress at all. Have you found a solution to your big dilemma? We both like houses two and three. Erm, I like three 100%, inside and outside. Yeah, I mean, I've got to be fair to Trish and also to myself. I do love house two. and we'll definitely go and look at the Mystery House. and I know Trish loves it. She loves it more than I do, to be fair. to what the other one is thinking and feeling. And that could prove quite difficult. or actually will it have to be another property altogether? living in a house he really doesn't feel comfortable in. Well, you have some time. Take that time. Good luck to you both. -Well, thank you very much for your help. It's been great. We'll work this out, won't we? Well, it's been quite a week with Trish and Reynaldo. To find one property you like is fantastic. and can't quite see past that yet. but let's give them time to find their own compromised solution. even if it's not one of ours. Let's hope that phone call comes very soon. See you next time on Escape to the Country. so their Cheshire house-hunt continues. 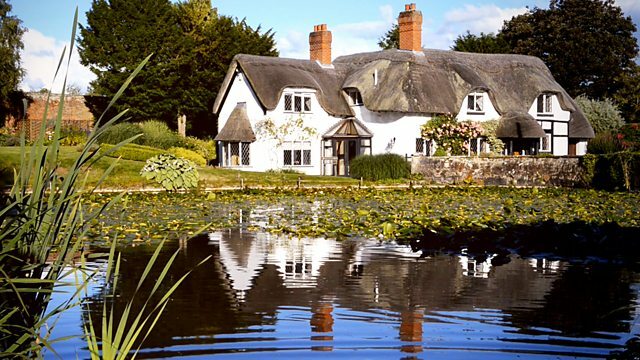 Sonali Shah goes house-hunting in Cheshire with an expat couple who want their £450,000 budget to transport them back from Germany to the British countryside. While in the area, Sonali learns more about Cheshire's waterways and visits one of the UK's largest collections of traditional canal craft.